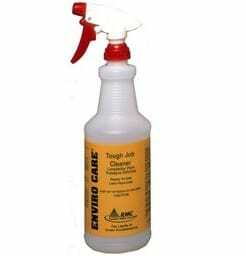 Green cleaning product customized Spray Bottle Click or dial (720) 746-0803 for Spray Bottle with long lasting label for the EnviroCare Tough Job Cleaner. Combine this with an upgraded spray trigger (the best available) for a spray bottle designed for a long life ensuring you many refills from either the individual EnviroPaks or the SNAP half gallon cartridge. This empty spray bottle matches the super concentrated refill packets for the EnviroCare Tough Job Cleaner Concentrate or SNAP EnviroCare Tough Job Cleaner. Reusing your spray bottle minimizes your cost, your waste and your carbon footprint.